Written in two sections, Lucija Tomljenovic, PhD, and Christina England have discussed important issues that they believe could be affecting the lives of hundreds of thousands of families around the world. For the first time ever, England has given the facts surrounding her own case of false diagnosis of MSBP, exposing the truth of how the medical profession and child protection agencies is failing to read crucial medical evidence and paperwork, which, in many cases, leads them to accuse innocent parents of abusing their children. England has discussed openly her own feelings about being falsely accused and how the accusation has affected her family forever. 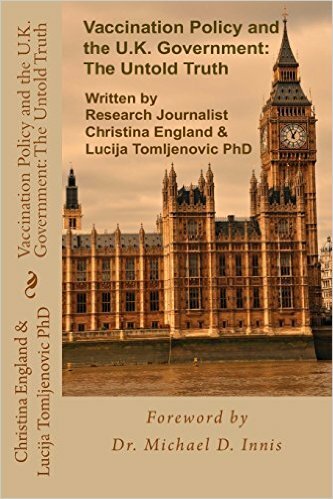 Lucija Tomljenovic has presented documentation which appears to show that the Joint Committee of Vaccination and Immunization (JCVI) has made continuous efforts over many years to withhold critical data from parents and health practitioners on severe adverse reactions and contraindications to vaccinations in order to reach overall vaccination rates which the JCVI deemed necessary for “herd immunity,” a vaccination concept which does not rest on solid scientific evidence. The medical profession’s credibility is shown to be compromised by the fanciful diagnosis MSBP (Munchausen syndrome by proxy), a diagnosis invented by Professor Sir Roy Meadow and given to a parent or caregiver to describe certain aspects of their behaviour such as requesting “unnecessary” painful tests or medical interventions to gain the attention of the medical profession. This scandalous accusation has been levied on hundreds of innocent parents. Also addressed by the authors is the Vaccine Cover-Up, in how the MMR vaccine Pluserix banned in Canada was introduced to the UK under a new name. Four years later, it was removed from the market in the UK, after thousands of children developed life-threatening adverse reactions. To learn the shocking details contained in these hidden documents, purchase this must-read book today and discover the untold truth.